Is there anything more universally dreaded in the business world than performance reviews? 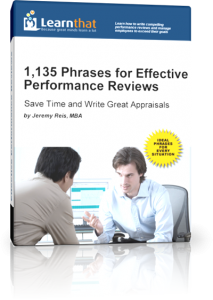 This ebook will help shave hours off of performance review time by providing full sentences you can use right now to complete your performance reviews. Performance reviews aren’t just dreaded, they also eat up a lot of your time. You know what you want to say, you just need help how to say it. This ebook will solve this problem for you – and also save you a lot of time. Over 1,000 Sentences You Can Use Right Now! We’ve created over 1,000 sentences you can use right now in your performance reviews. Simply copy, paste, and change the name to that of the employee. It can’t get any easier than this! You can add additional details to customize it for the employee, but each sentence is ready to go. This will save you hours on your performance reviews. 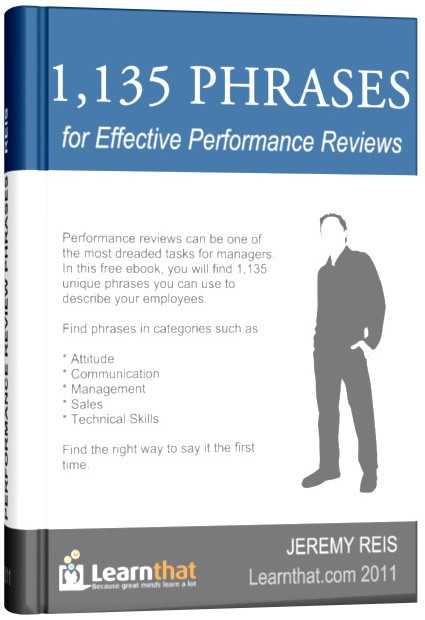 You’ve discovered hundreds of performance review template phrases on this site, but this book has 1,135 performance evaluation phrases in over 20 categories. We include exceeds expectations, meets expectations, and below expectations phrases so you’ll find the right things to say each time. The book is available in instant download in PDF format. You may dread performance review time, but you can love it by purchasing this ebook and shaving hours from your performance review time.